The post talks about the age old debate on the Android TV Box vs Amazon Firestick, so that you can make a great decision in buying the right decision to replace your cable subscription. Technology is moving very swiftly, and with such a pace, comes different choices. These choices are often very confusing. Particularly, when it comes to converting our television into a smart TV. We people love to multi-task, and need our entertainment in sync with our internet, where we spend most of our life on. You can many wonderful needs like streaming a favorite TV show or watching a HD movie on your television. For our kids, we love them enjoy their favorite games, or use social media on our beloved TV. Manufacturers today have spoiled us with various choices allowing people to convert their old-fashioned television, into a might smart beast. Two of the popular software available today is the ANDROID & AMAZON, helping us utilize the power the power of our television. All these, power our Android Canadian TV Boxes or the very popular Canadian Amazon Firestick. Today, we’ll see a quick mash-up between the Android TV Box vs Amazon Firestick to give you a thorough break-down on the best available TV streaming device in the market today. You can read a detailed review on Get the Amazon Fire TV Canada Edition – Review + Buying Guide! 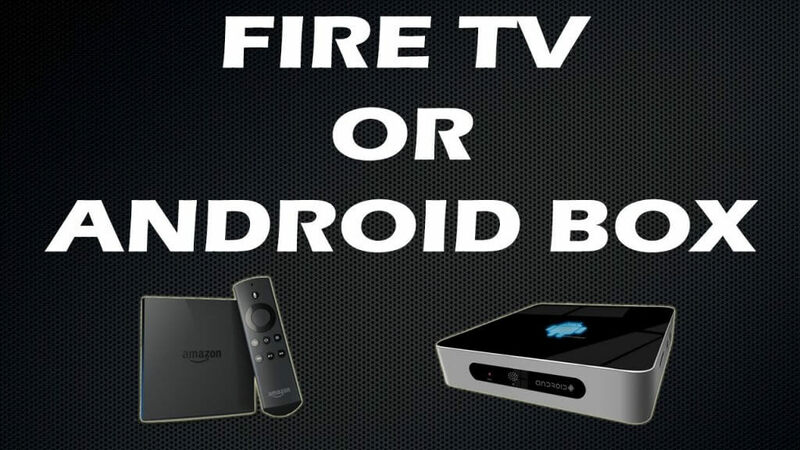 It is very difficult to pin-point which amongst the two are the best, Amazon Firestick or the Android TV Box. We therefore, will see in detail how both the two software and hardware stand against each other, with reference to Kodi and IPTV, the single source of entertainment for everyone. Before we start on with the discussion, let’s quickly summarize the two technology, on which we base our argument for Android TV Box or Amazon Firestick. Kodi is a leading application that is open-source and a single point of contact to view all the latest TV shows, movies, music, etc. through crowd-sourced addons. The app is especially made for entertainment lovers that love to stream sports, movies and TV on their smart device, and now want to relish the same experience on their television. The app is a standard android apk file, which can be played on any device that runs on the Android operating system. The Kodi app provides an excellent of means of streaming media content across the internet onto your TV using the Android TV boxes for Kodi, and now the Amazon Firestick. IPTV, just like Kodi, is an Android app that you can use to kill your cable subscription. The IPTV application sources all the live channels across USA and Canada and brings to you all at one place. The IPTV setting emulates just as your cable subscription, but much cheaper, in fact way too cheap. All channels including movies, news, sports, TV shows, VOD, etc. can be viewed on full HD resolution, through your internet. The IPTV works way better on your best android iptv box, connected to your television. Here, you can clearly see that the Android TV Box has greater support from Kodi and the IPTV app. But, if you know how to install the apk file on Amazon Firestick, then it is no stoping you from exploring streaming media on your fire TV. Amazon Firestick is just like a USB stick and can connect easily to your television. You get a 1GB RAM and 8GB internal storage for running your entertainment streams, plus Wifi and bluetooth. Biggest disappointment here is that you do not get an ethernet connector on the firestick. You can however buy an USB-powered ethernet connector from Amazon. In terms of resolution, you can view all your entertainment streams on 720p or 1080p resolution. The firestick is very small and can fit easily in the HDMI port of your television. Now coming to the Android TV Box, you get choices, in fact massive choices to select from. You can choose your android TV box as per various hardware and software specification depending on the tasks you will perform on your TV box. The Amazon Firestick is only available in a dual core Broadcom processor, while the best android TV streaming devices, comes with atleast a Quad Core Amalogic Processor, and more amount of RAM, starting from 1 to 4GB of RAM. You also get more internal storage, depending upon the choice, and a expandable slot to view more media. On the hardware front, the Android TV Box would run very fast and smoothly, compared to the Amazon Firestick. The Android TV Box is also designed to run the Kodi and IPTV app more efficiently than the Firestick. You also get a better remote, including the wireless remote control and external file storage on your Android TV Box to do things more differently and conveniently. The Ethernet port support is the cherry on the cake for the Android Box, where wifi signals may drop or be bad. So on the hardware front, the Android TV Box is a clear winner. Kodi and IPTV are android-driven apps, that means it is very easy to setup and install on the Android TV Box. To experience the best out of most streaming apps, you need the Android Streaming Box, that gives you an out-of-box feature to install and use every app effortlessly. You can also use Google PlayStore to find more such media streaming applications for your Android TV. While the Amazon Firestick is more like a fork from the Android software, it does not provide any easy means to install the Android TV apps. You will need to side load the Kodi and IPTV app, which is too technical for any normal person. And, also the chances to brick your Amazon Firestick is also very high. Amazon Firestick has a completely different store, where you can find various apps for streaming, but you won’t get the Kodi and the IPTV app, that is very easy to use and operate. The Kodi and the IPTV app are fluid on the Android TV Box and are designed to run quite smoothly on the streaming box. Also, a another important point here is that since both the Kodi and IPTV is designed specially for the Android Box, you can run videos upto 4k Ultra HD resolution, while on the Amazon Firestick you can only run it at 1080p resolution, that too with many hiccups. So in terms of using the Kodi and IPTV app, the Android TV Box wins, without any doubt. The Android TV Box runs pure Android software, so that you can easily install over 1 lac application from the Google PlayStore. Every app is optimized and runs quite fluidly on the tv box. In terms of stability too, the android box works quite well with the latest Android version. Coming to the Amazon Firestick, it runs on the customized variant of the Android, more like an Android fork. Hence, most of the Android apks may be quite unstable and usable on the Canada Firestick. You also will need more technical expertise to sideload the apk file on the firestick. So coming to the original Android TV Box vs Amazon Firestick debate, in terms with Kodi and IPTV app, the winner is clear – it is the Android Box, that gives you clear support and stability while using your apps. Amazon Firestick looks like a portable USB device that fits easily on every TV. You just need to simply use your HDMI port for connection. This makes it completely portable and easy to carry along, in case you are traveling to places. It is so compact that it can fit in your bag as well. Coming to the Android Box, it is very bulky and more heavy than the Amazon Firestick, due to its hardware. You will also have to take care while traveling, since it may break in your baggage. You will also need to carry power adaptor, remote control and wires for carrying along. So in terms of portability and comfort during traveling, the Amazon Firestick wins hands down without any fight from the Android TV Box. On our concluding talk on which is better for Kodi & IPTV – the Android TV Box or the Amazon Firestick, which one you should buy? If you see on the above requirements, we feel the Android TV Box is a must buy that will play Kodi & IPTV app with ease and fluidly. Downloading, installing and using the Kodi & IPTV app is very easy on the TV Box, than on the Amazon Firestick. The Google PlayStore is also quite helpful on the TV device. For the Firestick, you would need more technical expertise to install the Kodi & IPTV app, which makes it difficult for normal users. Also in terms of resolution, you can enjoy your videos in the 4K output, while the Firestick can run videos upto 1080p. The quality on both the device are capable in running movies or TV shows, much better than your cable subscription. In terms of portability and carrying around during traveling, then the Amazon Firestick scores full marks. You can go place with your Firestick, where cable isn’t available. The Android Box is quite bulky and heavy to carry around. So with this, we complete our guide on which device to buy. That is, Android TV Box vs Amazon Firestick.